certified under ISO 9001:2008, ISO 14001:2004 and OHSAS 18001:2007 standards. capacity of the nagpur plant has been enhanced to 80000 MT per annum. In order to cater to its existing Transmission Line Business and other opportunities in Structural Steel Business in India and globally, we ventured into Structural Steel Business as backward integration strategy. Since its inception in 2007, Karamtara Profiles has become a synonymous entity in the Structural Steel Business in India. Karamtara Profiles caters its equal steel angles with varied sizes ranging from 45x45 to 200x200 edge lengths for Transmission Line and Telecom Towers Businesses. The applications of these angles are wider from Transmission Lines, Solar Structures, Infrastructure, Industry etc. The products are manufactured using latest technologies at our state-of-the-art facilities at Tarapur, Boisar and Nagpur, both in Maharashtra, India. It manufactures High Tensile and Mild Steel Structural Steel with IS and BSEN grades. 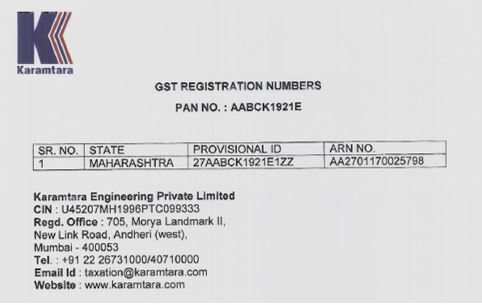 Karamtara Profiles is approved by PGCIL (Power Grid Corporation of India Ltd.). It manufactures its angles from prime source billets from large steel manufacturers like Steel Authority of India Limited (SAIL), JSPL, JSW, Rashtriya Ispat Nigam Limited (RINL), Gerdau etc. Our Tarapur plant has installed capacity of 200000 MT of both High Tensile and Mild Steel whereas our Nagpur plant has a production capacity of 80000 MT per annum with the combined capacity of 280000 MT of structural steel, making us one of the largest Structural Steel manufacturers in the country. We adhere to well defined quality standards and our products are tested using modern testing facilities including Spectrometer and Universal Testing Machine to ensure the products of superior quality and reliability. Our Plants are certified with ISO 9001:2008, ISO 14001:2004 and OHSAS 18001:2007 standards proving excellence and technological advantage. We at Karamtara deliver the highest level of commitment and service with competitiveness to our customers.